When Assistant Emergency Services Chief Dustin Ulrich was promoted a few short months ago, Emergency Services Chief Howard “Butch” Leonhard provided him with a list of expectations. Amongst those expectations was one that read “to pursue formal education in an effort to better the Chambersburg Fire Department, to better yourself, and to better the service provided to the citizens of Chambersburg, Pennsylvania.” Assistant Chief Ulrich has done just that. 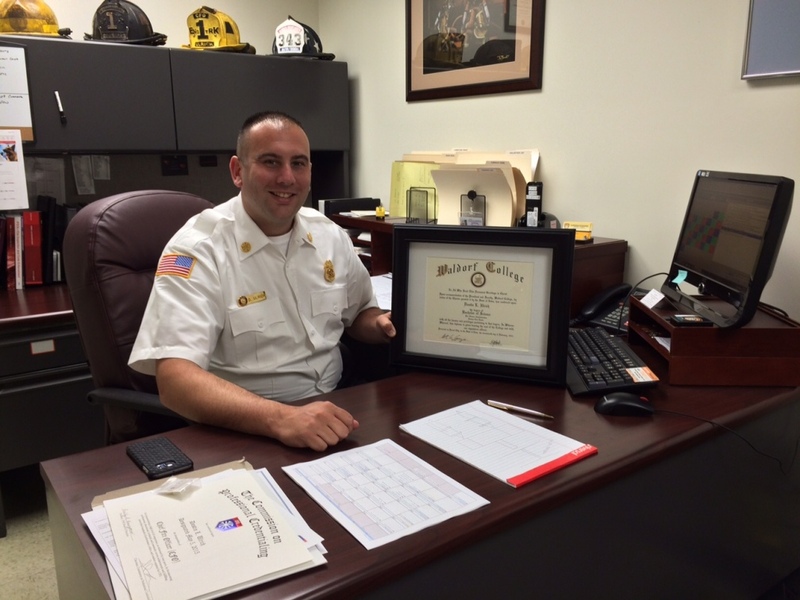 In March, he completed his Bachelor of Science in Fire Service Administration at Waldorf College. The pursuit of this degree opened another door for Assistant Chief Ulrich as last month he was awarded his Chief Fire Officer designation by the Center for Public Safety Excellence. This designation was created to recognize fire officers who demonstrated excellence and outstanding achievement throughout their career and developed a strategy for continued career improvement and development. The highly competitive CFO designation assures departments that their leaders have the educational and technical competencies necessary to meet the demands of today's society. Assistant Chief Ulrich has the letters CFO behind his name and a ribbon on his uniform but those in the fire service understand what an arduous task it is to complete all training, document all the real world experiences, and pass the scrutiny of a selection board that consists of peers from all over the U.S. This is the mark of a true professional. The Chambersburg Fire Department is proud of Assistant Chief Ulrich’s accomplishments thus far and looks forward to his future successes which will most assuredly make this Department better equipped to handle the complex issues the emergency services field faces every single day. Congratulations on a job well done Chief Ulrich!